THIS HAS BEEN DISCONTINUED. See here for new visitor SIMs. JCI has released a new SIM card targeting overseas visitors. Currently, there is only a U300 version available. (EDIT: This means it is unlimited data but at a 300 kbps speed.) I imagine that several other versions, such as a 1 GB Flat Rate may also be in the works. Pre-activation (no need to call with a Japanese mobile phone to have it activated after arrival). Pre paid by credit card only (No COD). Valid for 30 days with no extension. The SIM card is activated on the second day after shipping, which starts the 30 day clock. There are no refunds, even if the SIM card gets lost in the mail or delivery is otherwise delayed. While that's not quite ideal, there really are not any other options, since the card arrives with an active connection. Overseas phones must 1) be UNLOCKED and 2) support UMTS-2100 MHz, which is the primary European and Australian/New Zealand frequency. This will work with unlocked iPhones. The unlocked US T-Mobile phones I've used support 2100 MHz. Most AT&T android phones will not work with this SIM card. See here for a list of all (well, most) b-mobile SIM products and here for information on battery life. 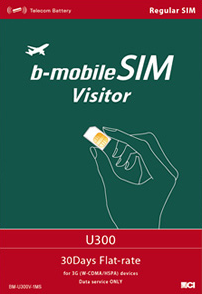 This SIM card relies on a 800 MHz 3G connection any many rural, mountainous area. This is known as the FOMA Plus Area. 800 MHz is not used, as far as I am aware, outside of Japan. As such, users of b-mobile SIMs with overseas phones are more likely to have little or no signal when waaaay back in the mountains. As for everyday use, there are typically few issues. in regards to FOMA plus it is possible for phones that support 850mhz to access it as the Japanese 800mhz bandwidth actually falls within the international 850mhz one. Any phone that has the hardware to handle the 850mhz bandwith should theoretically be able to do this but it does require some modification to the phones (software) radio. I have an international galaxy s2 i9100 and was able to flash the galaxy nexus radio onto to which really helped improved it's reception after I manually switched the settings to the Japanese region.I should note that my i9100 was having a lot of reception problems with b-mobile prior to that but after switching the radio it worked much better. Recently I've switched to a Galaxy Note N7000 and the same trick should work but I just haven't gotten around to it yet as it's current radio seems to be doing pretty well without it. Anyway for those that can read Japanese here is a blog that outlines how to do it for Samsung devices. Flashing radios is pretty easy if you are familiar with flashing roms in general and using clockworkrecovery. Interesting. I'm aware that 850 MHz supporting hardware can be tweaked for Japan. JCI did this with the IDEOS. Some radios (iPhone) need no adjustments. If you are on G+, join us here to discuss. Which radio are you running on your i9100? I would like to try it on my SC-02C, maybe I will get better battery life and reception. Hi SBS, I'm moving to Hiroshima on the 23rd to start a job and until I'm able to get a Japanese phone, I want to use a Japanese branded data-only SIM in my T-Mobile HD2 with Google Voice and GrooVe IP as a way to contact my family and friends here in the States. I don't mind the card being expensive, as I'll switch my Google Voice stuff over to my Japanese phone once all my paperwork is complete. From your (awesome) chart, it seems like my best options would be either the Aeon Plan C or the Fair plan? Make sure you get t-mo to unlock the HD2. Groove IP (according to nicholas) uses about 1.5 MB per minute, so it will burn through a FAIR charge very quickly. The Plan C or the 1GB Flat rate would be better choices. The 1 GB Flat rate will probably cost you the least amount of money because it has a lower initial buy-in cost. I decided to spend money on a paid VoIP service rather than piecing something together with google voice for free. I wanted to it be more reliable. Even so, google voice can be unreliable. Sometimes it takes too long to forward to my phones and calls go straight to voice mail. Not a huge issue, as I can call them back immediately. Also, I hook up the VoIP account to a old hacked vonage phone adapter, which has noticeably lower latency than the connection through an android phone. I get a slight lag on VoIP with my mobile phone - It's the phone, not the data connection. I get it on both the nexus one and nexus s.
I flashed the radio from the SC-04D but it's my understanding that the radio on the SC-02C is basically the same. It should also run on the 850 and 2100 bandwidths. In my case I can't say how well it would do out in the countryside as I mainly tested it in and around the big cities in Kansai. However one of the areas I used it in is notorious for having poor 2100 reception; it's near the mountains and Softbank phones almost never get a signal except in very small zones. My S2, using its international radio, really struggled too, but after flashing the Nexus radio and manually setting the Japan band, I found that any loss of signal was minor. The signal and battery life still wasn't quite as good as in the city but there was a considerable improvement. Sorry, just to clarify ... if I get this in micro SIM format, I can pop it in an iPad from outside Japan, and it should give me 30 days of internet / browsing then? Yes, it will work in an iPad from outside Japan. There are plenty in kansai, but probably not a the airport. The page is only in Japanese, though. You'll need to click the tab on the right at the top to switch to brick and mortar stores as opposed to online shops. 14 hits for Hiroshima: a bic camera, a bunch of Deo Deo's, Dos Para, and Yamada Denki. Not all shops carry all products, by the way. b-mobile recommends to call and confirm before heading out there. Because it's a little difficult to search and I can't construct a query link to link to hiroshima stores, so here they are. You are awesome man, thanks a bunch! > Full-size and micro SIMs are available. Full-size SIM cards are roughly credit card sized. So, while they may be full-sized as packaging, you can punch out the Mini-SIM or Micro-SIM versions. Meant to say "regular size", since to most people they only come in two sizes. SBSdroid, sorry, I have one more question. It seem none of the shops in Hiroshima carry the 1GB Flat Rate SIM card, so I am probably going to order it online. I was hoping that docomo would get the Galaxy SIII out early next month, but it looks like I will have to wait. The Japanese Ice Cream Sandwich phones currently available on the three providers are interesting, however I would like the ability to root and throw a custom ROM on my phone if I want... which limits my choices to the Galaxy Nexus (docomo) or the Galaxy SII HD LTE (au) right now. Anyway, I'm wondering what you think of my idea to get the 1GB Flat Rate plan with my T-Mobile HD2 and use it plus LINE for the time being until the GSIII becomes available? By the way, I meant using LINE for my co-workers and friends in Japan. I've got the GrooVe IP and Google Voice Full Integration set-up going and it's working great. I love being able to talk and text my friends and family for free! Makes the long distance so much better to deal with. I think that getting the 1 GB Flat rate is the best thing. At worst, your out 3000 yen and change - no contracts, nothing. Don't like it, don't recharge it. All prepaid. Check out the top navbar for the bmobile cell standby battery drain issue. Effects some phones, not others. I've been able to correct it on every phone I've tried so far. Probably best to follow the link to the J site to see if there have been updates to the list of phones that are confirmed to work properly. The only problem with the fix is that some phones think they have a 2G connection, even thought it is actually HSPA. This causes some voip apps like sipdroid not to work - throws up an error message saying that there is not an appropriate data network for making calls. Sipdroid does this by design - it is proper behavior. Unfortunately there is no way to override it. http://d.hatena.ne.jp/sgrmatha/20111220/1324382948 says making the Note use the Japanese Bands works, so if it doesn't work out of the box you could try doing that. I have a Motorola Razr XT910 and a Samsung Galaxy S3, Does any one know if they will work with bmobile?